Adam Lambert Live in Manila! Ladies & Gentlemen! 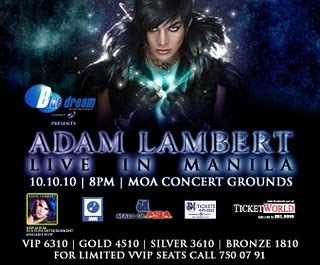 Adam Lambert, the ex- American Idol runner-up will be coming here in Manila to have a concert on 10-10-10, 8pm at SM Moa Concert Grounds. We will be hearing his songs that made him famous as a singer and a performer (not just as an ex-American idol runner-up)!